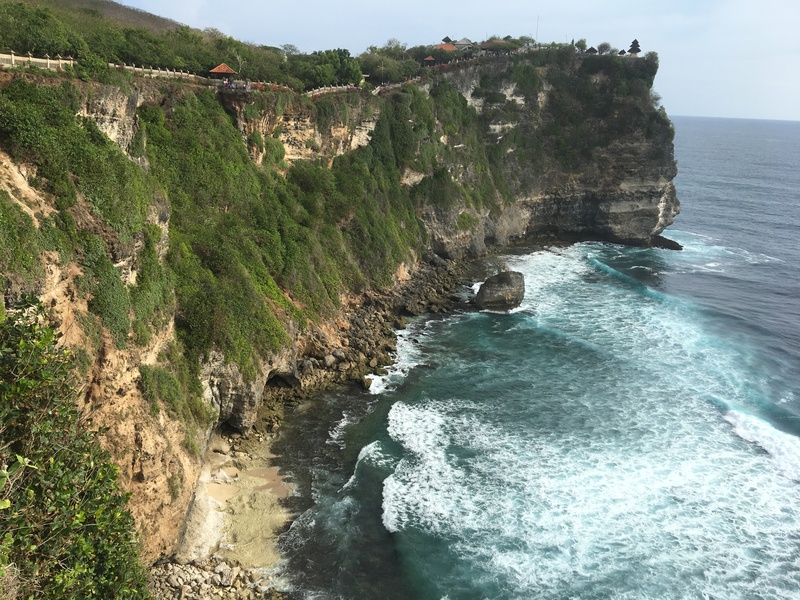 First stop – Five nights in Beautiful Bali! 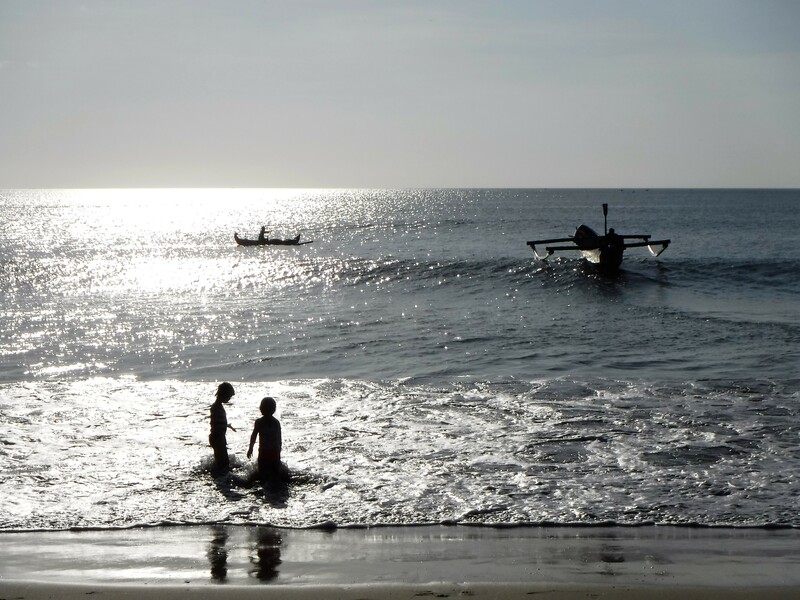 Bali was an add-on destination when we discovered it was a cheaper and more direct route to Darwin. We figured it would also be an affordable place to be lazy and recover from the journey. We booked 5 nights in Jimbaran Beach, very close to the airport. Our accommodation, Villa Happy, was cheap (£25/$40) per night including breakfast. It was a family run, Balinese style hotel with around ten bungalow rooms in a lovely courtyard around a pool. After a good night’s sleep we set off to explore. We quickly realised that we weren’t in a heavily touristy area. The main road was busy with traffic and motorbikes and there were no hotels, restaurants or tourist tat shops in sight. There were baskets of Hindu ‘offerings’ in every doorway, shrines with burning incense and small temples dotted around. It felt as though we were seeing the ‘real’ Bali but we always felt like we were safe apart from trying to avoid all the scooters when trying to cross the road! Down the road in the opposite direction the pavement was riddled with pot holes and there were piles of rubbish strewn around, in between the pretty baskets of offerings. Signs that Bali is still a relatively poor, developing country. After a 200m walk we found a deserted, beautiful, white-sand beach with a number of (empty) seafood restaurants facing the ocean. It was lunchtime, we were hungry and stopped at the first one we found with customers in (Blue Marlin). We spent a small fortune (£70/$100) by ordering the waiter’s set menu suggestion because I (Michelle) worked out the exchange rate wrong! *sigh*. We live and learn. We had far too much (mediocre) food and as we ate we wondered how these restaurants stay open in this part of town, it was very quiet. We had pot noodles for dinner that night! 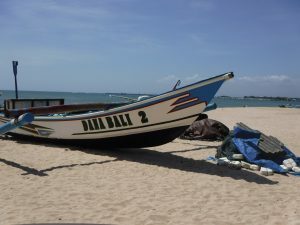 The following day we discovered how those restaurants make a living and why it was so expensive when we left the beach at sunset just as many bus loads of Chinese tourists arrived! 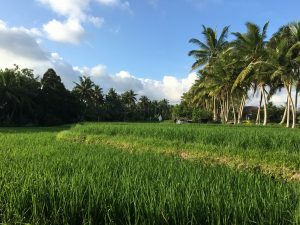 On Friday we took a taxi to a town further inland called Ubud. We quickly realised it was more of a tourist town but it also had so much more to see and do. We booked a lovely room at Ubud Terrace, right in the centre, for £42/$70 which, using my booking.com refer a friend coupon, reduced to £12/$20. 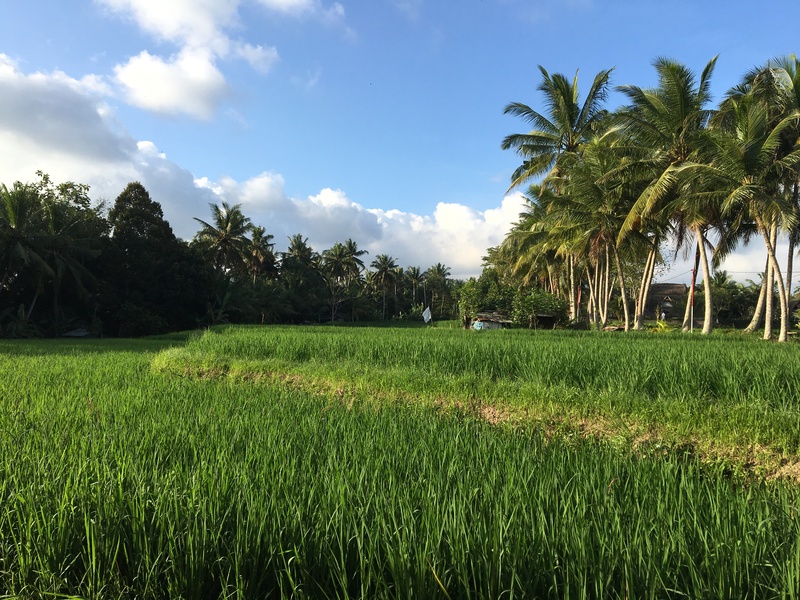 We walked through town and up into the beautiful, peaceful rice paddies to the north. At Sweet Orange Warung, we enjoyed a delicious Balinese meal as the sun set surrounded by the lush green grass-like plants. As we walked back towards town at dusk we passed a paddy worker bathing in the stream by the pathway. It was a reminder for me of how lucky we are to live in nice homes with running water that we take for granted every day. I’m not sure if the children understood or not, but in time they will. 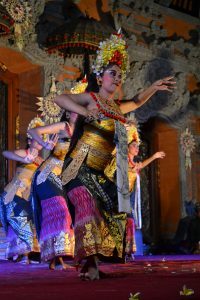 That evening we watched a traditional Balinese dance performance at the Ubud Palace. I’ll be honest, the repetitive beat of the music almost sent us all to sleep and we were a bit confused by the story, but it was interesting to see their style of dancing, the costumes were so colourful and intricate and there were some humorous parts in the show that made it worth while. The following day we visited the Sacred Monkey Forest, a protected jungle sanctuary containing three temples and hundreds of macaques roaming free. The children were in their element! Particularly watching the baby monkeys. We all thoroughly enjoyed our visit there and even did the tourist thing before we left – paid £1.50/$2 to lure a monkey to climb on us using a banana! 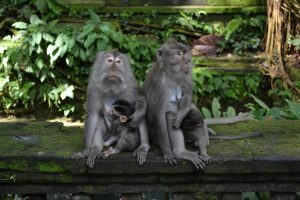 After a hassle-free stroll through the tourist market and fabulous meal in a lovely restaurant (Three Monkeys) it was time to leave Ubud and we were very sorry to go. Particularly when we arrived to find a pile of termite dust on our bed back in Jimbaran. Turns out the ‘sand’ we had been brushing out of the bed for days wasn’t sand after all, there must have been termites in the wooden ceiling. Hey ho you get what you pay for! The plan for our final day in Bali had been for schoolwork and relaxing. However, we don’t seem to do relaxing very well, especially when we’re in a new country, so we booked an afternoon taxi to visit Ulu Watu around 30mins away. Ulu Watu is a temple perched high up on a cliff face overlooking the sea. It was hot and we had a few grumbles from the girls about walking all the way to the end, but it was worth it, if only to see James in a sarong. The temple itself wasn’t spectacular but the location was breathtaking, and the huge crashing waves against the cliffs added to the effect. It was a memorable way to end our stay in Bali. Click here to check out the rest of our Bali photos. So, so glad this becomes a wonderful journey! Can’t wait to see the rest of this trip! Enjoy it all! Brilliant Michelle! So glad we can follow your adventures this way! Love you all so much! Fantastic stories! I love hearing about your travels. Thank you so much for sharing your adventures!